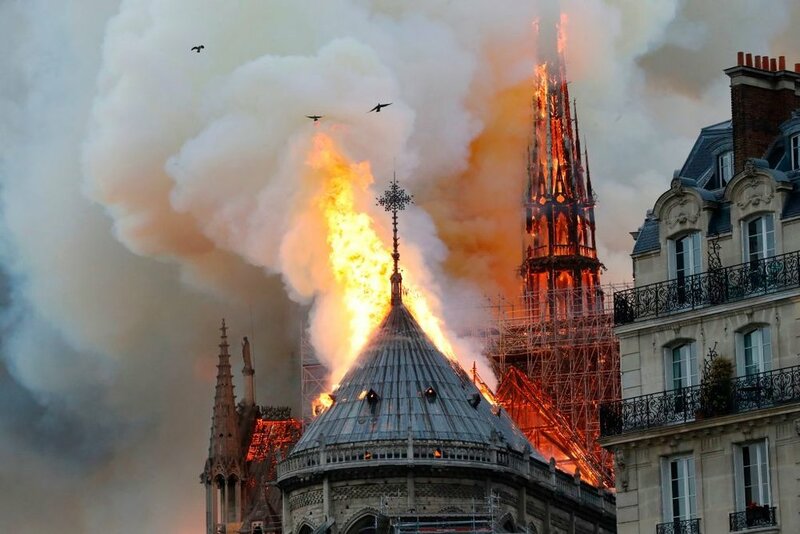 The world was, and remains, shocked, appalled, and in mourning over the Holy Week Monday, April 15, 2019 fire of the unique, iconic, and historic Notre Dame Cathedral in Paris. After decades of nearly-empty churches across the land, the city today weeps and is vowing to rebuild the magnificent historical hub and jewel of Parisian Christianity. Even non-Christians recognize its deeper spiritual and historical significance, while some others trivialize it as a sterile art exhibit as opposed to an icon of Western Civilization. President Macron is adamant that Notre Dame will be rebuilt. Inevitably, armchair warriors on social media have raised the same issue as our Lord’s disciples who were “indignant” that “a woman came up to [Jesus] with an alabaster flask of very expensive ointment, and she poured it on His head as He reclined at table.” They argued, “Why this waste? For this could have been sold for a large sum of money and given to the poor.” Our Lord scolded them, “Why do you trouble the woman? For she has done a beautiful thing to Me. You will always have the poor with you, but you will not always have Me.” And our Lord said that the memory of “what she has done will also be told in memory of her” (Matt 26:6-13). Many heard this very exchange during the Palm Sunday (Sunday of the Passion) Gospel that began Holy Week - the day before the great and terrible conflagration in the Cathedral. While determination surged to rebuild, and as offers to help pay poured in from around the world, to the tune of over $700 million early on - some questioned the propriety of rebuilding Notre Dame, as that money could be used for other uses instead. As the continuity of the Cathedral itself testifies, having withstood waves of revolutions and seismic cultural convulsions, wars, and political upheavals - history repeats itself, almost a déjà vu, even the idea that Notre Dame should not be rebuilt - for the sake of “Why this waste? For this could have been sold for a large sum of money and given to the poor” - resounds yet again. While it is wise to take stock of our financial situations, and while we are called upon to be good stewards, and while we do have a responsibility to the poor - we also have a responsibility to generations yet unborn, even those a thousand years hence, to preserve such unique sanctuaries and depositories of the faith and of the very history of civilization itself. This is especially true for Christians, most especially for those who believe in the Real Presence of Christ and His ongoing miraculous work on the altar, in the confessional, at the font, and from the pulpit. And while Christianity has become nearly moribund in France, the effort to rebuild the Cathedral may, if the Lord wills, being about a revival of Christianity - at least among some - in Paris. But to put the cost in perspective, $700 million amounts to about $10 per person living in France. Or consider that the Stade de France, the Parisian sports arena, was built in 1998 at a cost of €290 million. To put it a little closer to our present cultural and financial reality, and to put the amount into proper perspective, consider the price-tags of the ten most expensive sports stadiums in the United States, with the Number One spot going to Lost Angeles Stadium (2016), built at a cost of $2.66 billion. These ten stadiums alone add up to a cost of $15.31 billion. But I don’t recall any Christians offering the Matthew 26 “Ut quid perditio haec?” (“Why this waste?”) objection while wearing the jersey of their favorite teams. And this doesn’t even take into account the thousands of college football, basketball, baseball, and soccer arenas from around the country. Those who object to spending the money to rebuild Notre Dame never say what should be done with the rubble and ash from the devastation: the roof that burned, the spire that collapsed, etc. Just leaving the ashes and ruin to lie there for the rats to breed in isn’t exactly an option. Even razing the site would cost millions of dollars. Of course, the Church is not buildings, as the “God who made the world and everything in it, being Lord of heaven and earth, does not live in temples made by man, nor is he served by human hands, as though he needed anything, since he himself gives to all mankind life and breath and everything” (Acts 17:24-25). If it had been the will of God to permit the total and irrevocable destruction of Notre Dame, it would not diminish the true Church of the Lord Jesus and the Gospel of His redemption, His atoning death for the sins of the world, and the eternal life in store for His bride, the Church. And yet, here is a wonderful opportunity of witness to the world, to confess before our Lord and the angels, and even before the devil and the demons, the message of redemption and of resurrection, of hope, of the victory of our Lord Jesus Christ over all evil in this fallen world by means of the cross and the empty tomb. Christendom still has a message for, and a stake in, the peoples of this fallen world. Build beautiful churches, attend them, and cherish them. Build beautiful churches not because God needs such a house, but because their beauty reminds us of God’s presence, of His love. Use stained glass, include fine paintings, icons, and statues. Build beautiful churches, not boxes. Build beautiful churches, not auditoriums with stages and coffee houses. Build beautiful churches to express the beauty of our Lord. And if they should burn down, rebuild them. And then fill them up with your presence, with your prayers and songs. With God’s Word. With baptismal waters, with altars offering up body and blood. For these are the things that make a church truly beautiful. And the reason we build beautiful churches to begin with.